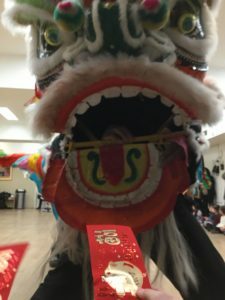 Children and teachers feed the lion at the 76th Street Lunar New Year celebration. A lion dance is a long-established event in Asian culture. It is carried out upon the arrival of Lunar New Year in order to bring good luck to all. During the dance, two performers wear a lion costume and their movements represent those of a real lion. Musical instruments including drums, cymbals, and gongs are played loudly in order to “scare away” evil spirits. The lion partakes in a custom (translated in English) called “plucking the greens.” Here, the lion is faced with lettuce (the greens), which are hanging on a pole, and is tied together with a red envelope containing money. The lion will approach the greens and the red envelope and ultimately eat and spit out the greens. However, the lion will keep the red envelope, signifying prosperity. 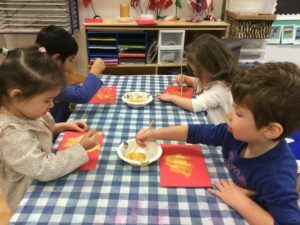 In the classroom, children create a Lunar New Year-inspired painting. 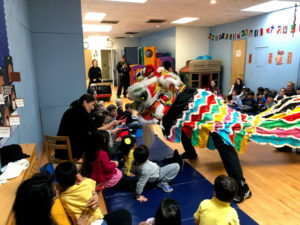 At all three locations, the children gathered in the gym to observe the lion dance and were given red envelopes to feed the lion when the animal came near them. 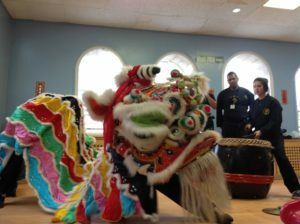 True to the traditional dance, the lion “awakened” from the floor and then moved around the room as the instruments played; the lion then “ate” the lettuce and then spit it out, to the delight of the students and teachers. Afterwards, each child took a turn to feed the lion his/her red envelope, which also elicited laughter and excitement. To introduce and/or follow-up to the Lunar New Year celebrations, many classrooms welcomed families to teach how they celebrate Lunar New Year via our ongoing culture share unit. By reading books, sharing treats (including oranges, which are another sign of prosperity in Asian culture), and creating puppets similar to the lion, the children were able to further understand and learn about the holiday. Happy Lunar New Year to all who celebrate! Interested in learning more about IPS curriculum? Take a peek into our classrooms by clicking here.